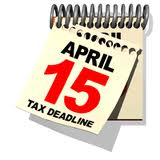 If you can’t file your 2013 tax return by the April 15 deadline, file for an extension to get until October 15, 2014, to file. You can request the extension on paper, by phone, or online. You don’t need to explain why you need more time, but be aware that an extension doesn’t give you more time to pay taxes you owe. To avoid penalty and interest charges, taxes must be paid by April 15.